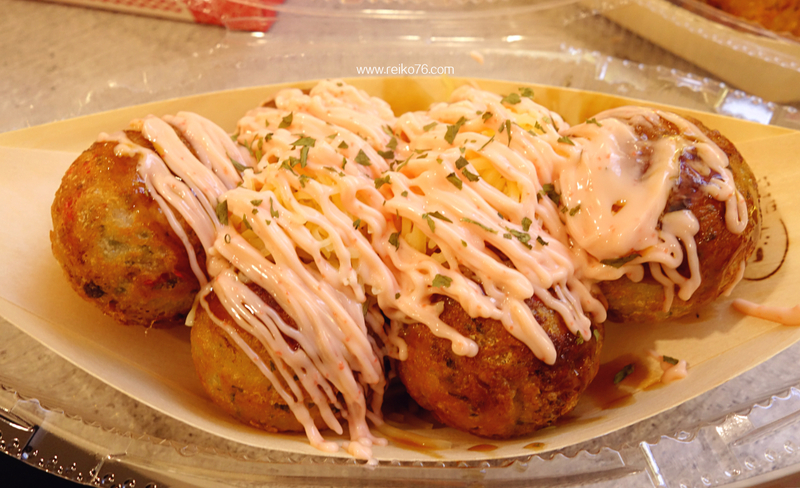 I hooked on takoyaki (octopus in fried wheat batter balls) when I did part time in MidValley more than 11 years ago. It's probably the first takoyaki stall in Malaysia and I bought takoyaki as snack almost every single day for as long I work part time in an office located beside mall. This is a rendezvous between me and takoyaki that I remembered, sadly now the stall is no longer there and I can't really find good takoyaki around KL area. Most of them tasted soggy, tasteless, super tiny bits of octopus, or over fried. I cannot express how disappointed I am over and over again giving chances to various takoyaki stall all over the city and yet unable to find that one stall that can gives me the same taste as the first one I went. 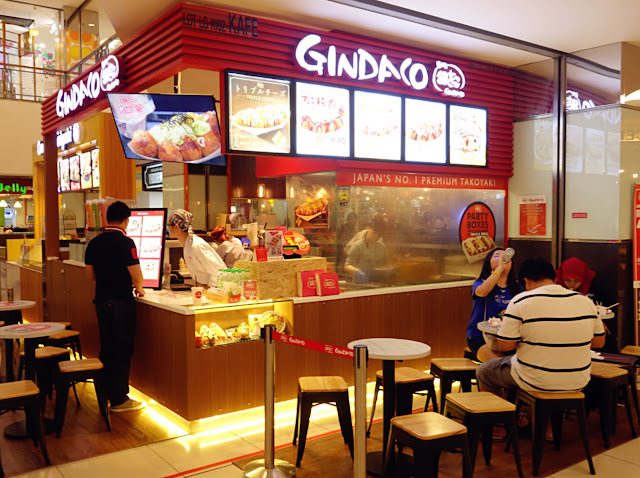 So when me and Fei went to 1 Utama and saw Gindaco I was like, since I'm beyond disappointed by others, why I don't give Gindaco a try and pray for magic to happen? Little did I know, Gindaco is a huge Japan takoyaki chain with more than hundreds shops alone in Tokyo ( more than 300 sites around Japan) and they are easily spotted with their red shop sign which located near to exits of train stations and bus stops. 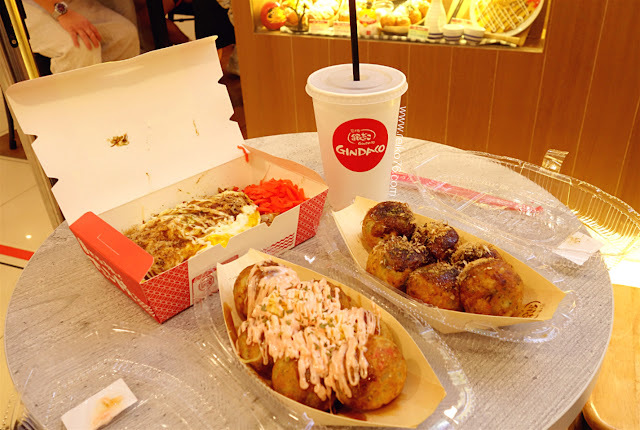 Unlike in Japan that usually have to eat these takoyaki at standing bar, Gindaco offers tables and chairs around the premise for customer's dining pleasure. When this Original Takoyaki was served, the first thing I asked Fei was: Where are the dancing bonito flakes (katsuobushi)? Watching the bonito flakes dancing on top of steaming hot takoyaki is a very satisfying view but sadly Gindaco's takoyaki doesn't have this. 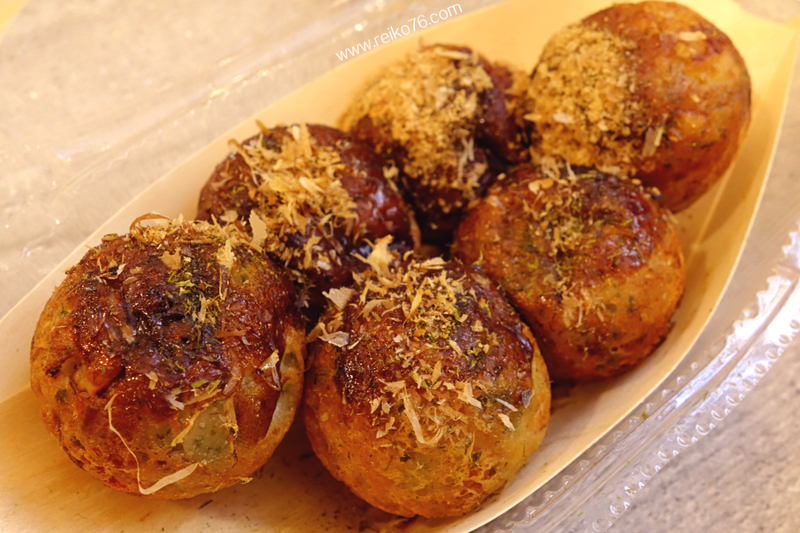 Aside from the missing bonito flakes, albeit having huge chunks of octopus inside these fried tako balls, the batter for making these fried tako balls tasted a bit bland in comparison. It can't compliment the freshness of octopus as well as the flavourful takoyaki sauce. It wasn't what I hope I'll find but nonetheless it actually tasted okay. Pairing with takoyaki sauce, mayonnaise, this yakisoba with egg tasted somewhat sweet ( too sweet for my liking as I like my noodles savoury). 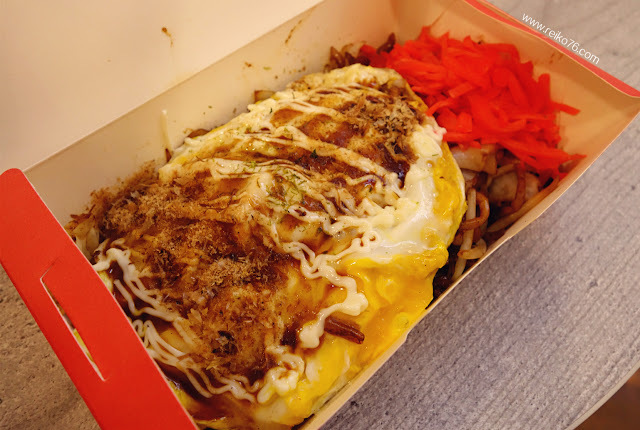 But when the sweet yakisoba pairs with mayonnaise and takoyaki sauce, their taste harmoniously blend together and I actually kinda like the combination. Down side of this combination is while consuming, egg's ration have to be balance or there'll be more yakisoba left without egg. I actually can't wait to stuff all 6 of these takoyakis inside my belly once I've tasted the cheese mentaiko sauce topping. 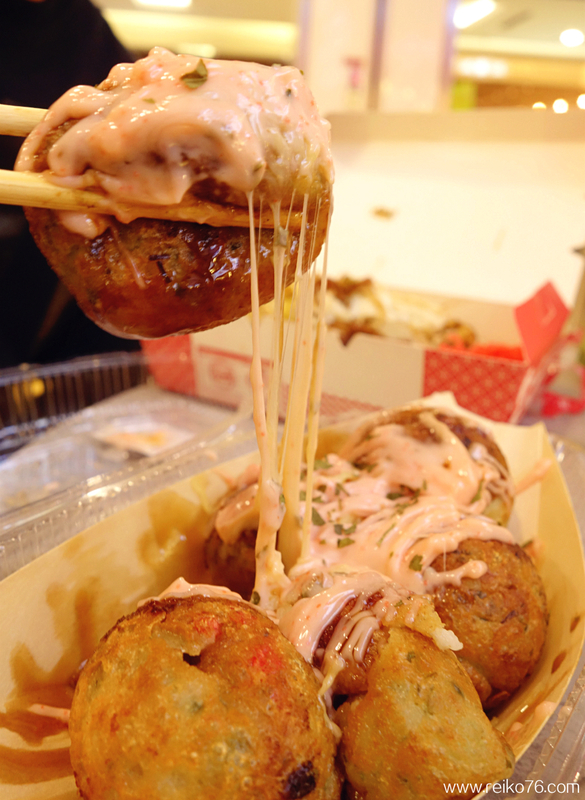 They tasted so heavenly, with melting cheese and mentaiko sauce that covers the takoyaki, I could swallow one boat of these in one shot. The savoury taste of cheese and mentaiko blends with takoyaki sauce indirectly bring taste to the bland fried batter that I mentioned above of the original ones. Cheese and mentaiko is life, nuff said. And while I was eating cheese mentaiko takoyaki, I glance over the sign board on top of me and I saw there's Triple Cheese flavoured Takoyaki and only available for limited period only. Damn~ Why didn't I read available options carefully? I would've ditch original ones for triple cheese flavour! Now that I had 6 takoyaki and yakisoba I couldn't stuff another three into my belly anymore. Well I do hope they'll bring back the triple cheese flavour, I could really use some cheese mentaiko or triple cheese flavour takoyaki anytime! Gindaco's flavoured toppings takoyaki proven to be somewhat delicious that all other takoyaki stalls I've tried and it kinda satisfied me in a way. For more delicious ones, I guess I'll have to personally fly over to Japan and get my takoyaki fix. Hey you need to little elaborate yourself. your site lacks introduction, its hard to tell what this site is all about. It has lot of things going on at the same time.